Nick is a graduate of the Oklahoma State University class of 2002, having earned his Bachelors of Science in Business with double majors in Management and Information Technology. Upon graduation, he excelled as an IT Specialist for Sprint Communications. In 2004, Nick began his insurance career when he accepted a Claims Adjuster Position at Progressive Auto Insurance. By 2006 he had achieved the role of Sr. Claims Handler in the Tulsa, OK branch. In January of 2007, Nick acquired his Oklahoma Insurance Producer Licenses in Property and Casualty, as well as Life and Health Insurance. 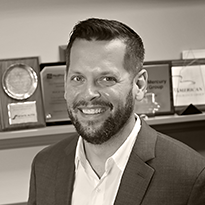 Within a year of becoming an insurance producer, Nick had successfully completed the Hartford School of Insurance for Producer Development (CLCS), and acquired his Certified Insurance Counselor (CIC) designation from The National Alliance of Insurance Professionals. Nick is currently pursuing a Chartered Property and Casualty Underwriter Designation (CPCU) through the American Institute for CPCU. Nick has excelled in handling risk management, insurance, and surety needs for a wide array of clients including those involved in the sectors of Energy, Construction, Manufacturing, Hospitality, Not-for-Profit Services, and a variety of successful Start-Up Operations. Nick joined the professional ranks of Rich and Cartmill in May of 2017. Nick serves as Board Secretary and Beverage Chairman for Tulsa International Mayfest. He has interned on the Board of Directors and continues to provide volunteer service for Community Action Project. He is a current member of Leadership Tulsa and had attended class 47 of the Flagship Program. Nick has been named Oklahoma Magazines 40 Under 40 Class of 2013. Nick has also been an active member in a leadership capacity for Tulsa’s Young Professionals.